Join JCFerrero-Equelite Sport Academy Coachs Club! What is Equelite Coaches Club? 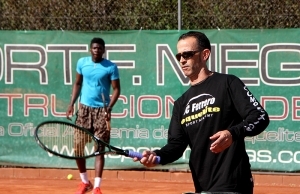 The academy offers the possibility of learning from the most experienced staff in the academy (Juan Carlos Ferrero, Antonio Martinez Cascales, Samuel Lopez) through an interactive virtual club Equelite Coaches Club. You will have the opportunity to visit the academy and practice with our coaches and players, as well as to access to our online platform where you can find educational forum, tricks and advices. It is totally free, don’t miss this chance! General tips, advices and experiences of our Staff, also a monthly written memo form Juan Carlos Ferrero, Antonio Martinez Cascales and Samuel Lopez. 10% discount on any stay in the academy for the coach and a partner (you will practice with the players, have any of our courses or just have a relaxed time in our Rural Hotel). 20% discount off if you bring a group over 10 players. Free accommodation for the coach and the partner if the group is over 20 players. An additional 10% discount on all Equelite workout clothes. Send an email to tenis@equelite.com with your CV and personal details. In a few days you will get further information about whether your application has been accepted. If you are in, you will be able to start using all benefits of being part of the Equelite Coaches Club.